display correctly. Try Google Chrome or Mozilla Firefox. The plot shows the monthly mean sea level without the regular seasonal fluctuations due to coastal ocean temperatures, salinities, winds, atmospheric pressures, and ocean currents. By default, the long-term linear trend is also shown, in red, along with its 95% confidence interval. The plotted values are relative to the most recent Mean Sea Level datum established by NOAA CO-OPS. Width: pixels (default is determined by window width). Data source: ? months from NOAA + ? months from PSMSL. For a simple explan­a­tion of the mean­ing of the 95% con­fi­dence & pre­dic­tion inter­val traces shown in the graph, see this two-minute instruc­tional video, by Dr. Gerard Verschuuren. To see precise values, hover your mouse cursor over the graph traces (or touch the graph on a touch-screen). To download the seasonally-adjusted monthly MSL data from NOAA, in CSV format, click here. 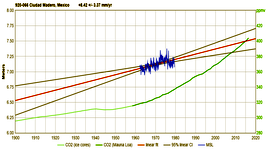 We also have a graph of just carbon dioxide (CO2) levels, and a combined graph of CO2 and CH4. †Calculation of Confidence Intervals and Prediction Intervals for monthly Mean Sea-Level (MSL) is complicated by the fact that MSL measurement data is serially autocorrelated. That means each month's MSL measurement is correlated, to an extent which varies by location, with the MSL measurements of the previous and next months. That means there are effectively fewer independent measurements, which would cause a naive confidence interval calculation to underestimate the breadth of the intervals. The code here follows the method of Zervas 2009, “Sea Level Variations of the United States 1854-2006,” NOAA Technical Report NOS CO-OPS 053, p. 15-24, to account for autocorrelation, when calculating confidence intervals and prediction intervals. That isn't the only way to do it, though, and one of the items on my to-do list is to examine an alternative approach suggested by Willis Eschenbach.